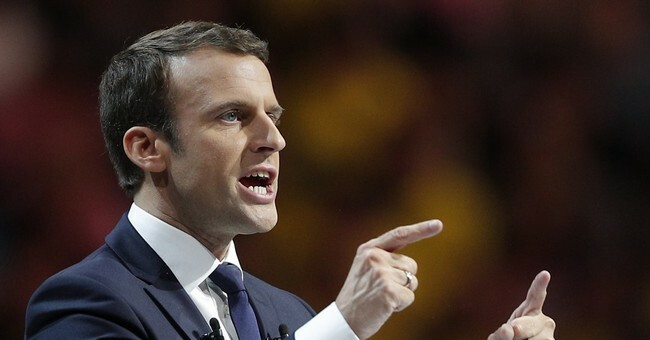 French presidential candidate Emmanuel Macron went on a tirade against his own countrymen at a campaign event Thursday night, just days before the conclusion of the 2017 election. While speaking about Front National leader Marine Le Pen and her supporters, Macron labeled them the "true enemies" of France. “They’re here. It’s they. It’s they who are our true enemies,” he declared. “Powerful, organized, skillful, determined... You pass them in the streets, in the countryside or on the web, most often well hidden. As hateful as they are cowardly. You know them. The party of the agents of the disaster, the fearmongerers. The French far-right. It’s here." Macron also branded them racists, liars, and haters. “They use anger, they propagate lies. For decades they have fanned hatred, fomented divisions, imposed their discourse of discrimination,” he said. And moments later, Barack Obama formally endorsed the centrist candidate. “I’m not planning to get involved in many elections... but... I am supporting Emmanuel Macron to lead you forward," Obama said to the French people in an online video. Hillary Clinton used similar language at a campaign event in 2016, labeling her fellow citizens as “racist, sexist, homophobic, xenophobic, Islamophobic” people. The French elections will conclude on Sunday.